I'm still contemplating my possible bid on an apartment. The good news is that so far, there doesn't seem to be anyone else who's seriously interested in the place. The bad news is that on a second visit with a measuring tape, it's a little smaller than I thought, and I decided I might really want to renovate the bathroom before I moved in. Then, there's the ????? news. After noodling around with various numbers, I did a serious re-vamp of my real estate spreadsheet. 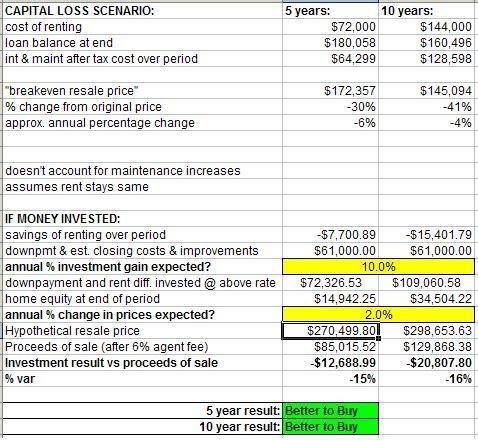 The old version just told me whether I could afford to buy based on my monthly costs, overall budget, and savings goals. Those are not factors I can ignore. But then there is the next level, of deciding whether higher monthly costs make sense, even if I can "afford" them month to month. 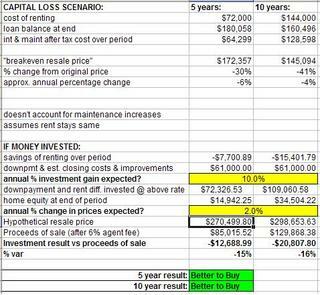 I put the whole "capital loss" calculation into a new tab on my spreadsheet, and also added a comparison of my potential gains from buying vs. potential results if I keep renting and invest my money. I'm looking at two timeframes, 5 years out and 10 years out, with just two variables to input, potential investment returns percentage and potential real estate appreciation percentage. 1) What if the real estate market slows down a bit from its recent insane levels of growth, but continues to show moderate gains each year, say 5%? I'd have to have really strong gains on my investment accounts every year to beat the advantages of buying. I wouldn't want to count on earning 12% every year. 2) What if the real estate market slows down and prices decline a little bit, but basically stay flat, as they did in the mid-1990s? Yowza, in that scenario, I could keep my money in a savings account and probably make out better! I'd be better off buying in the short term in this scenario, but over 10 years, if I kept up a 10% annual gain on the investments, it would start to outweigh the benefits of owning a home. This was a surprise. At first I thought it was because the tax benefits of owning decrease over time, but then I realized that I actually don't have that factored into this spreadsheet at all! But I think tackling that would be beyond what my brain can handle right now, so for the moment, the 10 year scenarios will always have a slight bias in favor of buying! 4) This would be another possible scenario-- the real estate market flattens out but gains very slightly. However, there's a crash in the stock market and my investments don't do very well. Long-term, I still come out ahead by owning a home, but in the short term I might not be able to sell my apartment at a worthwhile price. 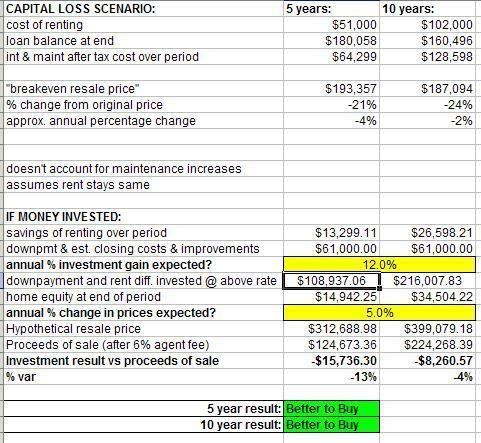 It's really interesting to experiment with, though it may all be moot if I can't get anyone to sell me a studio apartment for $245,000, which is the price all these scenarios were based on! If you want to play with the spreadsheet yourself, you can download it here. This may be obvious to you, but most of your scenarios assume that (1) you will have the option of staying up to ten years in your studio at a below-market rate and that (2) you would be willing to stay there that long (as opposed to renting elsewhere. How likely is that? Of course nothing is guaranteed, but I think my landlord plans to stay put and things are stable with the building (which is small and owner-occupied). I am very fond of my current apartment and will stay there as long as I can unless I buy something. It would be nice to have more space, but I wouldn't leave where I am now to pay more rent somewhere else, it's just not worth it to me when I have plans to buy. I figure that my rent going up could be equivalent to the co-op maintenance going up-- since I haven't accounted for either one, they'd sort of balance each other out. Your blog made for fascinating reading. If nothing else I admire your tenacity and discipline. Anyway I live in Toronto and compared to NY real estate is pretty cheap so I consider myself fortunate. Anyway I could not download your real estate spreadsheets. Do I have to be a member of your hosting site? Anyway good blog.